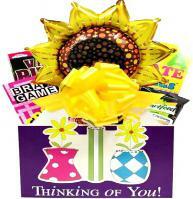 Bereavement gift baskets make a perfect gift to express your deepest sympathy to show you care. 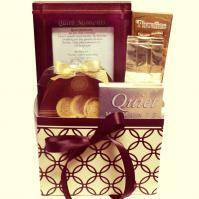 Help loved ones through this difficult time of grieving with a thoughtful bereavement basket. When there has been a death in the family, it's customary to send flowers with a personal sympathy card. Flowers are wonderful in times of sorrow, no doubt, but if you want to give something really distinctive to express your condolences, we make it easy with unique bereavement gifts by Adorable Gift Baskets. 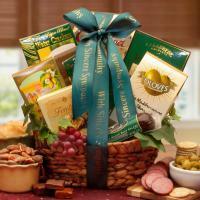 You can thoughtfully contribute to the meals with a bereavement gift by Adorable Gift Baskets. Our sympathy gift baskets are elegantly arranged and are stuffed with delicious comfort foods that can be shared by family and friends. One example is our Chicken Soup bereavement gift featuring the book, Chicken Soup for the Grieving Soul. 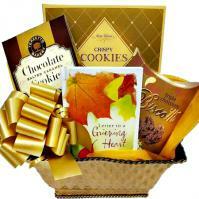 This personalized sympathy basket will delight all those visiting with its gourmet cookies, English breakfast tea, Ghirardelli gourmet coffees, deluxe nut mix, lemon bon bons, and chocolate Swiss roll cake. It will arrive at your loved one's home wrapped with a lovely bow and a hand written gift card. It also features an optional memory photo frame to commemorate the deceased loved one. You can also opt for our Chicken Soup Gift Trunk. This creative bereavement gift comes in a luxurious leather trunk with the book, Chicken Soup for the Soul, along with comfort foods such as hazelnut, gourmet soup mix, smoked almonds, Ghirardelli chocolate squares, honey, and a special gift mug. Another excellent bereavement gift by Adorable Gift Baskets is the Footprints in the Sand sympathy basket. This inspiring gift will help your loved one through the grieving process with its comforting words, sweet butter cookies, biscotti sticks, flavored coffee, herbal tea, and tea cookies. 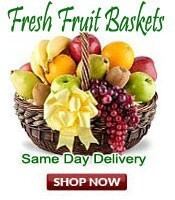 You can also choose from our fruit bereavement gifts, chocolate sympathy food baskets, flower arrangements, and other unique gifts. 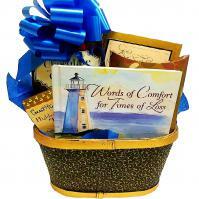 Adorable Gift Baskets offers a variety of appropriate selections to warm the heart of any loved one, and you can be a part of the healing process by sharing a thoughtful bereavement gift.